I had a brief conversation with Kris Ligman this evening about the Game Church, which led to me reading an interview they did with Steve Gaynor of Fullbright about Gone Home. In reading it, I had what the kids are calling “some feels” and while it won’t make a very long blog post (sorry America), it’s too longform for Twitter, and thus I resort to writing what should be a pretty short blog post. I thought it was important to acknowledge the presence that Christianity has in your standard middle American home as part of the milieu that you discover as you are exploring the house. Now, before this Gaynor mentions how the religious stuff in Gone Home comes from his own experience, and that he wanted to discuss the impact that Christian belief systems can have on suburban homes. I get what he’s saying, but in light of the idea that they were trying to create a “standard” American home, I read this and cringed a little, since the default assumption of Christianity is Problematic. 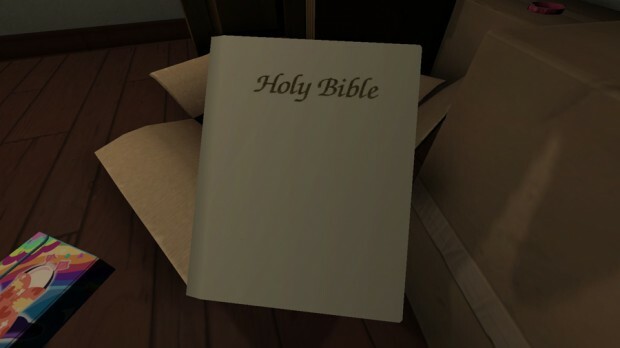 That said, I do think religion plays an understated but very clever role in the story of Gone Home, as embodied in a few of the items you find around the house. The picture the game paints of Terrence Greenbriar is not particularly religious-seeming, but I do think it paints the picture of a man who might turn to religion for comfort (as I have seen my own family members do in my lifetime). Terrence is a probable victim of child abuse, a man squarely in a midlife crisis where his job became unsatisfying but making a living out of his hobby has fallen through, whose marriage is becoming increasingly rocky and whose wife is cheating on him (though he doesn’t seem to know). There’s every indication that he lives in the shadow of his writer father, who I believe is, if not a literary critic, then an academic in English Literature or similar (he wrote a book on Joyce you can find in the basement; see also his critique of his son’s book, also in the basement). So the idea that he is keeping that Bible close at hand, possibly even reading it a chapter at a time at night, is not a far leap to make. Contrast that with the copy of Whitman’s Leaves of Grass that his wife’s lover has loaned her (you can find it under her side of the bed), which might also be someone seeking a way out of a midlife slump but in a definitely non-religious sort of way. These are two very different Bibles and they’re found in two very different situations. Terrence’s is close at hand; Sam’s is discarded, found forgotten in the bottom of a moving box in her closet. Terrence’s looks quite old, with the old-style deco cover font and the possibly leather cover. Sam’s, by contrast, seems shiny and new: pristine white and barely touched, with a much more modern (well, for 1995) chancery-style cover font. Comparing these two and doing a little extrapolating actually presents some really interesting scenarios. 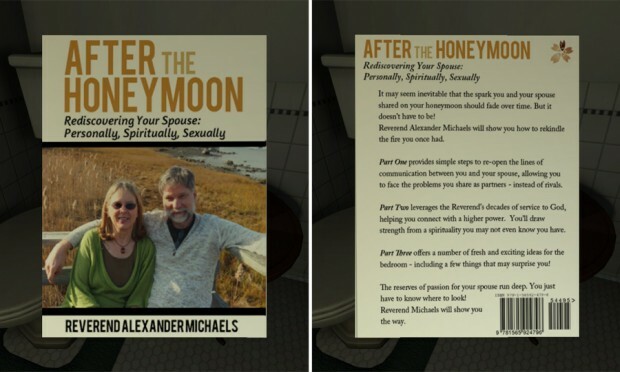 In my mind, I feel like Terrence has been trying to find solace in the Bible for a long while, much longer than the scope of the family drama found in Gone Home. The Bible that Sam has seems like a gift: someone gave it to her in the hopes that she would find answers in it. Lord knows that there’s other attempts to “figure out what to do with” Sam in other parts of the house, and at least one of those is a book that was a gift from her father about making friends “even when you’re shy,” according to the cover. And either Terrence or Jan is reading a pop psychology book about raising teenagers that you can find in the first floor bookshelves called A Stranger Under My Roof. I mean, these are obviously proof that Terrence and Jan just Didn’t Understand Her At All when it comes to Sam, but I feel like the presence of the two Bibles hints that they were at least considering religion as a source of answers. Yeah. This book appears, interestingly enough, in the master bath of the parents’ bedroom (sidebar: the Greenbriars appear to be big bathroom readers in general). There’s no real clue who was reading it, but safe money seems to be on Terrence: Jan is dealing with her martial issues by having an affair, meanwhile Terrence is just seeking desperately to find a way to make things better like they used to be. That he might turn to religion for the answers isn’t so surprising. Then again, it could be Jan’s. You don’t really know, nor is there any way to know. Which leads me to the personal history part of our show. Like, denial that anything is wrong is a distinctly “suburban upper-middle class white family”-coded response, and as Gaynor says, Christian dogma is often (not always) part of that network of intersecting influences. I know at least two or three people who came out to their parents and were told “No you’re not.” And then they refused to discuss it. I’m not sure I can prove that’s a statistically significant majority of responses, but when that audio log triggered, so did my memories of their stories. And interestingly, the denial wasn’t about not believing, as Sam said (though her line about “respecting me enough to believe me” is quite good). In fact, it was about believing but not wanting others to find out; it was about being able to show your face in church on Sunday when people knew you had a queer child. It was about believing but thinking the problem is fixable, or that it will just go away if you don’t pay attention to it. It was the denial that wasn’t. I am reminded of my own coming out to my mother and stepfather when I was 16, which was not my Barbie Dream Date version, believe me. I was prepared for anger, for fury, but what I mostly got was confused resignation. My mother just kinda stared at me. My stepfather, in his infinite lack of human emotions, asked the glorious question, “Well are ya active?” which… I remember that exact wording because I hadn’t learned this phrase yet but 2013 me would have said “What does that even mean? !” So there’s that. At first I looked at this line a little side-eye, but I think if Gone Home has any message about religion, it’s this: It might be natural to look to organized religion for answers, but it won’t provide satisfying ones. It makes sense that, faced with so many problems they cannot grasp, either Terrence, Jan, or Terrence and Jan would head to Christian ideologies and religious dogma to find an answer, but I think the end result is that they don’t work. Sam doesn’t touch, read, or even acknowledge that Bible she has. 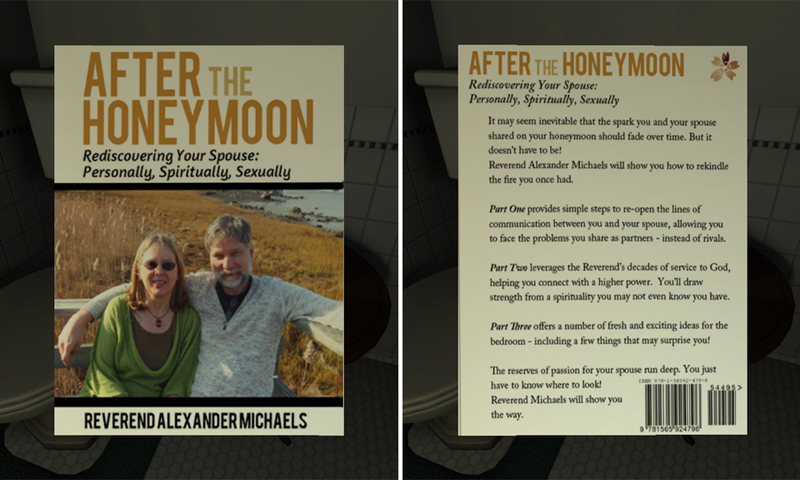 The Reverend Whatsisface’s suggestions for fixing the marriage aren’t working, but you can see that Terrence was pushed in the right direction for fixing things, since the brochure for the couple’s retreat with the “BOOKED!” mark is in what is undeniably his desk in the greenhouse. There are other things, too. Consider the child abuse story of Terrence Greenbriar. The letter that his uncle sends to his mother about wanting to talk to his family again — a letter she never replied to — has extremely strong overtones of religious redemption and forgiveness rhetoric in it. Oscar very much sounds like a man who has committed a mortal sin and wants to right it, to find absolution (his word exactly) before he dies. I think there’s every suggestion that the Greenbriars, at least, are a religious family to begin with, perhaps in the achingly familiar “we’ve always been an [x] family” sense where, as Gaynor seems to imply, they believe, but they don’t know what they believe in, if anything at all. Great read. Interestingly, I assumed that the book in the bathroom was Jan’s. I got the sense that Terry was completely absorbed in his writing troubles and probably didn’t realize there was an issue. Meanwhile Jan’s hopeful affair was cut short when she got a wedding invitation from Ranger Rick, so she scrambled to try and quickly pull their marriage back together and suggested the couples counseling retreat that may or may not have conveniently coincided with their anniversary. The fact that the brochure is in his desk simply said to me that she gave it to him. 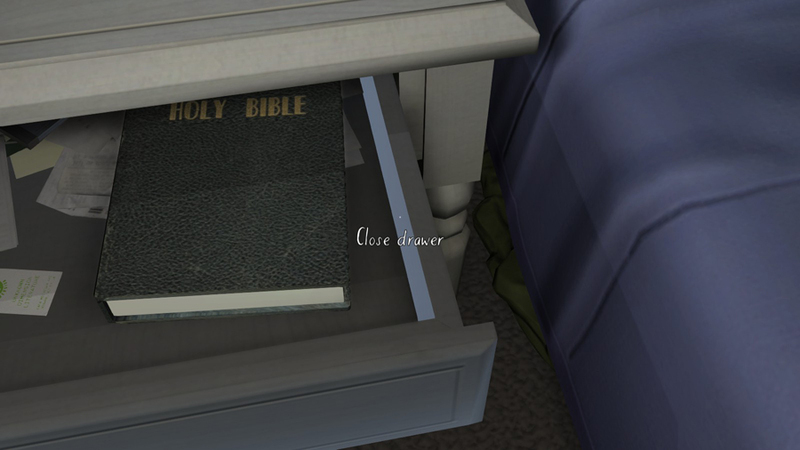 On the use of religion in Gone Home, there is also Oscar’s cross in the hidden passageway to consider. I don’t remember what exactly was written on it, but it had some words of prayer. It also was the only ghostly thing players encounter, where the lightbulb is scripted to burn out after you pick up the cross. I did too! Re: thinking the book was Jan’s, but my reasoning was a little different, in that in my experience, as far as hetero couples *in media texts* go, the woman is the one who wants to save the marriage while the man is the one who has the affair/cheats. So interesting subversion, there. Also I didn’t figure out that the wedding invitation was his, which is a really important fact for figuring that out. Knowing that fact NOW, I think your read is much more likely. I never picked up the cross, and in the process avoided the one “BOO! HAHA” scare moment, so maybe that’s a blessing in disguise? Now I need to trick a friend into getting me a screenshot of the cross. Good read. I would point out another item that was probably the single thing in whole game to make me so angry at the characters I had to get up. I wonder if it was too hidden for most to find it, but it deals with the idea of “fixing” Sam as you put it. In the greenhouse on it’s side next to the desk is a clipping of the TV Guide about a documentary program about Gay camps. To me this says they were considering sending Sam to one of these “correction camps” as an option. In fact, I was afraid until I got to the attic that is where everybody was. In part because I got dates mixed up for the couple’s counseling. I’m curious if you saw that and what your take on that piece would be in relation to the whole from a religious standpoint. Holy jesus no, I didn’t see that. Oh man. That is… kinda bonkers. I might edit the post to add this, with credit to you for bringing it up. Yow. Oh wow, this post and the comments are making me realise there’s a lot of things I overlooked or missed, or didn’t make connections between in Gone Home. I mean, I missed the entrance to the greenhouse entirely. I feel like that has to be central to any criticism though: you have to admit the possibility that there’s something you didn’t see, or a connection you didn’t make. That’s one of the things that sets Gone Home apart from any more linear text. 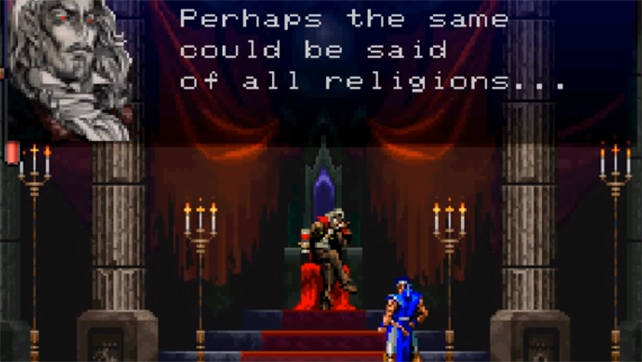 As to the place of religion in the home, I feel like it stood out a lot to me, but I suspect that’s because Australian culture is far more default secular, to the point where it’s unusual and noteworthy to discover that somebody is religious, or grew up in a religious household. The kind of casual/habitual religious observance that many people will read into Gone Home is pretty uncommon in my experience here, though that was less true a couple decades ago. I read the marriage advice book as being Jan’s as well, though I couldn’t tell you exactly why. She certainly seemed to be the only person who noticed there was any problem, while Terry seemed wrapped up in his work. On that same note, Terry seemed to be turning to drink more than faith as a solution to his problems.